Casa Central concentrates on transforming lives and strengthening communities with a special focus on Hispanics living in the Chicago metropolitan area. La Posada Interim Housing Program for Homeless Families integrates the consistent delivery of a variety of services that address underlying causes of homelessness. Case managers and colleagues provide families with counseling, childcare, employment assistance and crises intervention during their residence. At the same time, the team works with landlords to identify an independent apartment for the family. More than 1,000 families have been assisted by La Posada and more than 90% of them remain living independently. For more about Casa Central, visit their website. “My career goal was to become a clinician, and so my SSA education was centered around working with individuals, families and groups. At the time, I didn’t know that I would one day lead a large social service agency. But what I learned at SSA really did prepare me for this work. 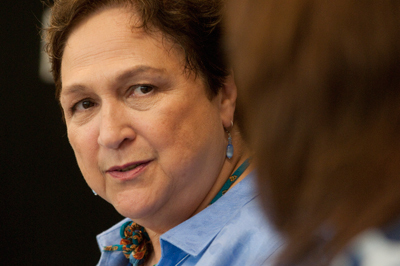 SSA instilled a rigor in me for research, the seriousness of the field of social work, and the importance of backing up your theory with information,” reflects Ann Alvarez, who leads an agency helping families navigate the complexities of making Chicago home, pursuing opportunities and improving their lives. Ann notes that her experience at SSA was rigorous, particularly her first year, but a supportive environment of students and faculty made a huge difference. “My time at SSA was very enriching. My professors, as well as many fellow students, were so supportive and one in particular became my mentor. Pastora Cafferty (Pastora San Juan Cafferty, Ph.D) really opened my eyes and challenged me from day one in her class to think beyond my scope. We have maintained a 30-year plus friendship. When I call her to talk or ask a question, we are immediately into an area three times broader than my original thought and that always enlarges my vision and broadens my perspective.